Due to popular demand, six additional playdates were added for Tony Award for Best Play “M. BUTTERFLY” in order to accommodate more audiences. This news announcement was sent by Tony and Grammy award winning producer Jhett Tolentino and FRONTROW Entertainment. VENUE: Maybank Performing Arts Theater, BGC Arts Center, Bonifacio Global City. With a total of 21 performances (with no extension), “M. Butterfly” was written by David Henry Hwang and will be directed by award-winning artist Kanakan-Balintagos. The cast are as follows: RS FRANCISCO (Song Liling), OLIVIER BORTEN (Rene Gallimard), NORM MC LEOD (Toulon), LEE O’BRIAN (Marc), REBECCA CHUAUNSU (Comrade Chin), PINKY AMADOR (Helga), MAYA ENCILA (Renee / Pin Up Girl). The members of the ensemble playing the role of Kurogo are as follows: JOHN PAUL ORTENERO, PHEITH LENA BALLUG, KAY MEGAN KIERULF, AIRA JAY IGARTA, ULYSSES BASA and RICA NEPOMUCENO. The artistic team of M. Butterfly is formed by the following: Kanakan-Balintagos (Direction), Jhett Tolentino and RS Francisco (Producers), Eric Pineda (Costume Design), Joed Balsamo (Music Composition), Ohm David (Set Design), Jethro Joaquin (Sound Design) John Batalla (Lights), and Gery Penaso (Make-Up Designer for Song Liling). 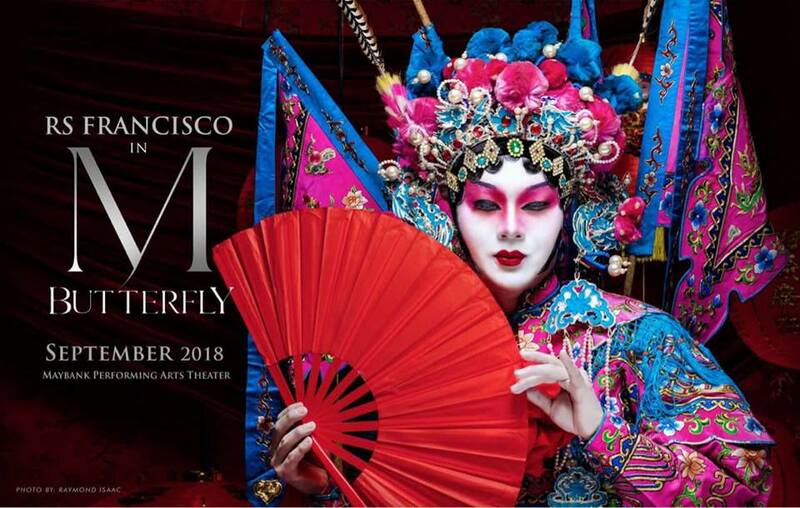 This re-staging of M. Butterfly was also designed to benefit charitable organizations with various causes as most performances will be 100% non-profit. For tickets, call TICKETWORLD at 8919999.